In 1933 John Pemberton with other medical students at University College London offered first aid to the Jarrow Hunger Marchers. Concerned by the marchers’ condition, he wrote an article on “Malnutrition in England”, linking malnutrition to the level of unemployment benefits. After completing medical training, he worked with Sir John Boyd Orr on a nutrition survey of some 5,000 British children. In 1941 he was appointed tutor (later senior lecturer and reader) in the University of Sheffield Medical School and worked on vitamin deficiency with Professor Sir Hans Krebs. In 1958 he took up the Chair of Social and Preventative Medicine at Queen’s University, Belfast, a position he held until retirement in 1976. Professor Pemberton died on 7 February 2010 (see obituary www.guardian.co.uk/science/2010/apr/14/john-pemberton-obituary). Whilst on study leave in the USA during 1954-5 John Pemberton met Harold Willard. Together they started the ‘International Corresponding Club’, which became the International Epidemiological Association (IEA). On return to the UK in 1956 he took a leading role in founding the Society for Social Medicine (SSM) (see J Epidemiol Community Health, 2002, 56,342-6). 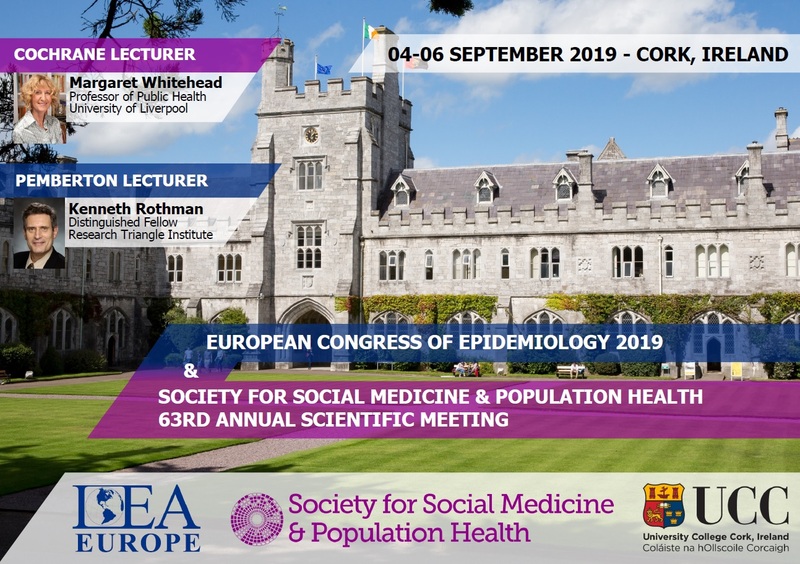 In September 2007 the Society for Social Medicine ASM was held jointly with the European section of the International Epidemiological Association. This meeting at University College Cork, Ireland was the 50th anniversary of the first meetings of both the IEA and SSM. In celebration of these fiftieth anniversaries and in recognition of Professor Pemberton’s role in the foundation of both societies, SSM established an annual John Pemberton lecture. The inaugural John Pemberton lecture was presented by Professor Jørn Olsen (president of the IEA). More information is available on the SSM website (www.socsocmed.org.uk/pemlec.htm), where a list of previous lecturers can also be found (www.socsocmed.org.uk/ssminfo.htm). Archie Cochrane (1909-1988) made many highly significant contributions to medicine and to medical research. He is best remembered for his challenge that the reports of medical research, and in particular, randomised trials, be organised, evaluated and up-dated at intervals to give a valid evidence-base for medical and surgical practice. His frequent challenges led Iain Chalmers to set up the Cochrane Collaboration, which, in turn, led to a paradigm shift in clinical practice summarised in the phrase: ‘evidence-based medicine’. Archie was a founding member of both the Society of Social Medicine and the International Epidemiological Association. He valued both and was a very frequent attender at their meetings. He often expressed delight at the inclusion of disciplines other than medicine, and later, in playing a key role in the setting up of the Faculty of Community Medicine (now the Faculty of Public Health) he was concerned lest this, being within the Royal College of Medicine, might become exclusive to those who were medically qualified. Archie was a lateral thinker with almost unlimited interests in medicine, and the encouragement he gave to others, and especially to junior research workers – whatever the topic of their research – enriched many a career. On the other hand, he was deeply concerned at the lack of rigour in the evaluation of clinical interventions. He yearned for more attention to be given to the prevention, rather than the treatment of disease. The origin of this concern of his predates his involvement in clinical activities. A self-written obituary can be found at www.cardiff.ac.uk/insrv/resources/scolar/bmj_alc_obituary.pdf. The first Cochrane Lecture of the Society of Social Medicine was given by Peter Elwood at the Annual meeting of the Society in Glasgow in 1990.More information is available on the SSM website (www.socsocmed.org.uk/cochlec.htm), where a list of previous lecturers can also be found (www.socsocmed.org.uk/ssminfo.htm). This is the responsibility of the SSM Committee. At the April/May Committee meeting, the President seeks suggestions for eminent speakers to invite to give these two lectures the following year. Usually there will be two names agreed for each, one to be invited and one to be invited if the first declines or is unable to accept. In line with the work of Pemberton and Cochrane, the Pemberton lecture focuses on epidemiology and the Cochrane on evidence-based healthcare. A list of past Pemberton and Cochrane lecturers is available on the SSM website at www.socsocmed.org.uk/ssminfo.htm. The President invites the two speakers (and the reserve if necessary) and notifies the Committee at the September meeting (and the chair of the ASM organising committee earlier, if desired) of the outcome. If the ASM organising committee has a particular reason for wanting a specific individual to be invited, they can contact the SSM Committee by the beginning of April 17 months before their ASM to make the case but it is the SSM Committee that makes the decision. This is the responsibility of the SSM Honorary Treasurer. HG3 sends a cheque to the lecturers after the ASM. The honorarium was £400 for each of the two lecturers 2004-2011 (and possibly before then). In 2012 it was increased to £500 each and the decision made to index link this thereafter to the nearest £10. This is the responsibility of the ASM organising committee. The Chair or other designated person needs to contact the invited speakers to ascertain the title of the lectures (for the programme), agree the timing of the lecture, and, nearer the time, ascertain their travel details. The speakers have their accommodation and registration at the ASM paid for by the ASM, including the ASM dinner; their travel costs are also reimbursed by the ASM. It is customary for the SSM Committee to take the invited speakers out to dinner on the evening prior to the ASM (paid for by SSM but organised by the ASM Chair) and for the ASM Chair to take the speakers out to dinner after the reception on the first evening of the ASM (paid for by the ASM). The ASM Chair and SSM President each thank the speakers afterwards.